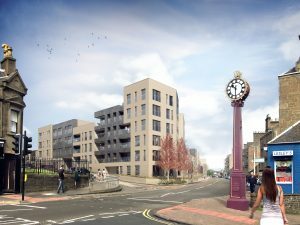 Demolition works are soon to start which will enable work to get underway on a site in Dundee which will transform the look of the Hilltown. Robertson Partnership Homes have this month started work on a development at Derby Street that will bring 163 new homes to the city. David Zwirlein, Hillcrest Housing Association director of development and new business explained that “Not only will the homes be good quality and affordable, they will be energy efficient and meet a range of housing needs. Stewart Shearer, Robertson Partnership Homes’ managing director said “The new affordable homes being built at Derby Street will make a significant difference to residents in Hilltown and we are pleased to be leading the project as main contractor. Construction work is now underway and we will be working closely with Dundee City Council and Hillcrest Housing Association throughout, as well as engaging with the local community. 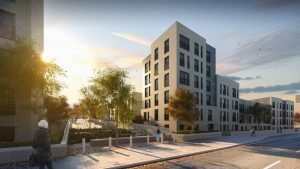 Dundee City Council’s Neighbourhood Services Convenor, Kevin Cordell said “This start on the £26 million development at Derby Street continues the Council’s commitment to the regeneration of the Hilltown following on from the new affordable housing and new schools at Alexander Street.